The Naniwa S2 Super Stone is here and we've put together a few money saving sets with our best selling grits. The Naniwa S2 Super Stone is exactly the same stone as the one called the Naniwa Sharpening Stone, only the name and packaging has changed to reflect what discerning sharpeners have been calling it all along. This set contains the 3 matched stones starting with the coarse 220 and finishing with the very fine 5000 grit. This set is a great value and a nice matched set for most knives and tools. The finish the 5000 grit leaves will be sharper than almost all factory edges. The Naniwa Super Stone gained fame as a hard-wearing, splash-and-go stone that created an unbeatable polished edge on steel. Sharpeners fell in love with them for being so user friendly and such a good value. At one point, the Super Stone line was divided in two with a thick and a thin version, and the name was changed to the Sharpening Stone for the thicker stone and the Specialty Sharpening Stone for the thinner. The renamed stones remained unbeatable quality, and they continued to gain in popularity due to their great value and excellent results. The original name had stuck though, and sharpeners continued to call them the Super Stone or sometimes the New Super Stone. Now the name Super Stone is officially back. The Naniwa S2 Super Stone continues the tradition of quality. It is exactly the same stone as the one called the Naniwa Sharpening Stone, only the name and packaging has changed to reflect what discerning sharpeners have been calling it all along. The Naniwa Super Stones come in two varieties, the S1 and the S2. They are exactly the same except for thickness. The S2 Super Stones are 20mm thick. The S1 Super Stones are half that at 10mm thick. Both the S1 and S2 Super Stones are 210mm long and 70mm wide (about 8-1/4" x 2-3/4"). Resin bonded Super Stones don't require soaking in water prior to use. Splash some water on the top of the stone, and it is ready to go. Resin bonded Super Stones are harder wearing than many other water stones. S2 Super Stones won't dish or cup as quickly and will need less flattening less often. 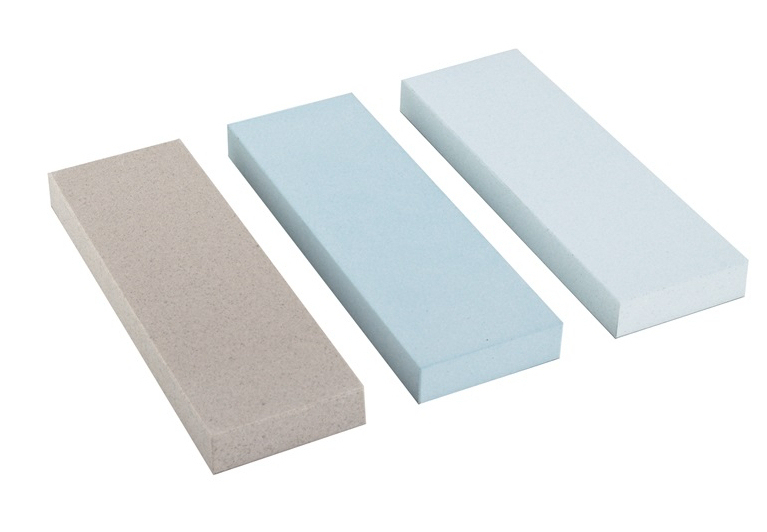 Resin bonded Super Stones have a high concentration of abrasive particles which contributes to speedy sharpening. Q. Do Naniwa Super Stones require flattening? A. Over time, all waterstones require flattening. The bonding material of the stone will wear, providing fresh abrasive material. This is why waterstones sharpen so quickly. This is also why they need to be flattened periodically. Flattening can be done with a Naniwa Flattening Stone or a DMT Dia-Flat 95 Lapping Plate. Received my Sharpening System today,(Norton IM83) and I've got to tell you that I am excited about using this product. 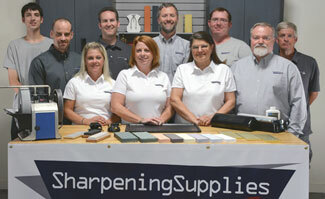 I've been in the meat cutting business for 45 years, and as you can imagine, I've used allot of different types and styles of sharpening equipment. I have had 3 Norton Multi-Oil Stone units in my lifetime, and then I see this IM83 and I think that this is what I need to carry with me when and wherever I go. I just LOVE this little box full of expertise equipment to keep me sharp and at a razors edge. Thank you for the service, it was fast and easy, and I received it within 3 days of ordering. I know knives and how they work, and I can't wait to start putting that edge on my "other" knives I own.